Compound locomotives employ a high-pressure cylinder group before passing the steam to a second, low-pressure group. The first successful compound locomotives were three 0 - 4 - 2 tanks built in 1876 to the designs of the Swiss-born engineer Antole Mallet. The purpose of compounding is to extract the maximum power and efficiency from the steam raised in the boiler. 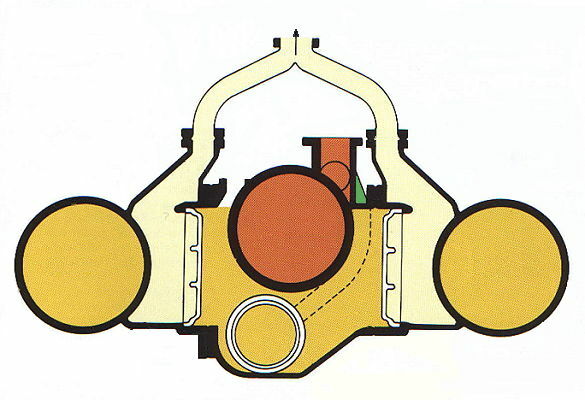 Firstly, steam from the boiler is admitted to both high- and low-pressure cylinders for a great percentage of the regulator valve movement and the cylinders and valves then act as in a normal expansion locomotive, also known as a simple locomotive, as shown in part 5 - Valves and Pistons. When the regulator is opened further however, the high-pressure steam from the boiler is fed only to the high-pressure cylinder. When the steam has completed its cycle here, it is then transferred to the two low-pressure cylinders before being exhausted towards the blastpipe. As developments in cylinders and boilers changed, so one design became popular before the other overtook it. One problem that affected early simple locomotives was a restriction of the steam ports to the cylinders at short cut-offs. This frequently resulted in steam being severely throttled and leading to a drop in the delivery pressure to the cylinders and therefore giving a power loss. Improved valve gears with larger steam port openings at short cut-offs gave an advantage to the simple design, but when these modifications were fitted to the compound locomotives, they gained the upper hand with additional benefits. Larger port openings here produced a softer exhaust beat and so reducing the amount of unburned drawn through the boiler tubes when the locomotive is working at a high-powered output. In 1905 the simple locomotive claimed superiority with the introduction of Wilhelm Schmidt's firetube superheater. This largely overcame the major problem of condensation in the cylinders of simple locomotives and giving an increase in power output by up to 20%. From 1908, superheating was also fitted to the compound locomotives resulting in equally large savings. Some British railway companies produced a small number of compound locomotives, but others including the Great Western remained faithful to the simple expansion design, however compounds remained popular over parts of Europe, especially France.